Like no place on Earth!! Have unforgettable moments as you spend your day with an array of wildlife. Meet Hercules the Liger, the World’s Largest big cat! Feed Bubbles our 9,000 pound African elephant, play and interact with baby tiger cubs, watch an eagle soar, meet Ramses our resident cheetah, monkey around with great apes and so much more! Located at our 50 acre wildlife tropical preserve in South Myrtle Beach (not far from The Market Common), this is a once-in-a-lifetime experience and 3-hour guided tour that can only be had at Myrtle Beach Safari. This experience is a fully-guided walking tour which is completely interactive and lasts approximately 3 hours. RESERVATIONS ARE REQUIRED for the Wild Encounters Day Safari Tours (tour pricing begins at $339 per person and may be significantly higher during holidays, peak periods, and during the busy summer season). Digital upload photo packages are also available at an additional cost. 2. After purchasing your tour, we’ll send an e-mail confirmation providing you with the address of our animal sanctuary and preserve, directions, and details on what to bring/what not to bring. 3. If you pre-purchase a digital upload photo package, during your tour, our professional photographers will take amazing, candid photographers and a short video of you and your group. You will need to purchase a digital upload photo package for each person who will be in the photos (please talk with our staff ambassadors at check-in if you have questions). 4. After purchase, ALL reservations are non-refundable, but are fully transferable for up to one year. No exceptions. 5. Tours last approximately three hours and operate rain or shine. While uncommon, we reserve the right to reschedule or cancel tours. 6. Your Safari tour and/or Photo Encounter purchases at our locations (either Myrtle Beach Safari or Preservation Station) will help support the Rare Species Fund (RSF), which provides infrastructure, training, education, and support for international conservation programs worldwide. To date, RSF has donated more than $1 million and countless hours of professional expertise, engagement, and hands-on training to grassroots conservation program worldwide. These programs ultimately help to conserve tigers, lions, elephants, gorillas, chimpanzees, and many more species in their natural habitats. Things really get wild after dark! Doc Antle’s Wild Encounters Night Safari is an amazing new experience that is distinctly different from our Day Safari Encounter Tour. 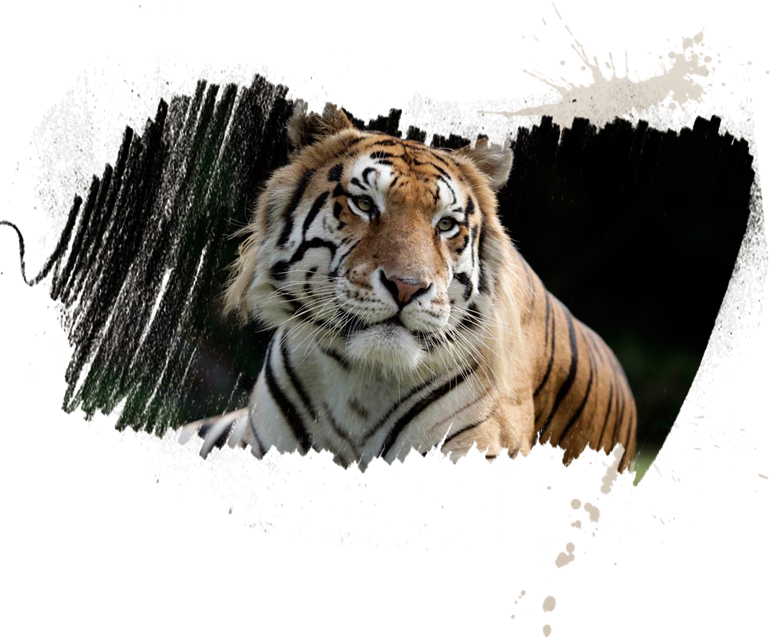 As you make your way through the most exquisite lush tropical garden, you’ll come upon our grand Tiger Palace where you’ll be introduced to a dazzling array of adult Bengal Tigers ranging in color from the exotic Snow White tiger to the rarest tiger in the world, The Golden Tabby. After enjoying a light dinner, you’ll have an opportunity to hand feed these amazing big cats in a once-in-a-lifetime encounter that you’ll find nowhere else in the world. You’ll relax in our courtyard with Bubbles our gentle 9,000 pound African elephant and get up-close and personal with amazing endangered wildlife including monkeys and many more. 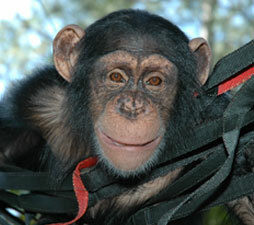 You’ll also have an opportunity to toast marshmallows with Sugriva, our beloved and world famous chimpanzee. Doc Antle has really done it again with this amazing new Night Safari adventure. RESERVATIONS ARE REQUIRED for the Wild Encounters Night Safari Tours (tour pricing begins at $299 per person, and may be higher during holidays, peak periods, and during the busy summer season). Digital upload photo packages are also available at an additional cost. Be sure to check out the pricing incentives when combining our Day and Night Safari tours ($100 discount per person is included in your combination Day and Night Safari tour pricing). This experience is completely interactive and lasts 3 hours. RESERVATIONS ARE REQUIRED for the Wild Encounters Night Safari Tours which are $299 per person (summer, holiday, and peak season dates may be higher). 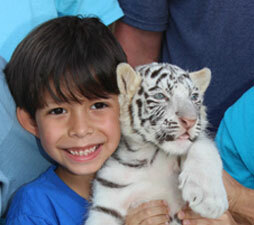 Digital upload photo packages are available at an additional cost. 3. If you pre-purchase a digital upload photo package, during your tour, our professional photographers will take amazing, candid photos and a short video of you and your group. You will need to purchase a digital upload photo package for each person who will be in the photos (please talk with our staff ambassadors at check-in if you have questions). 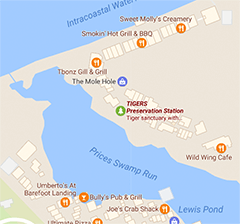 Come view our incredible and rare adult and baby tigers for FREE at Preservation Station, Barefoot Landing in North Myrtle Beach! Seeing the tigers is FREE during our normal hours of operation; however, a fee applies for participating in a very BRIEF photo encounter with baby tiger cubs or baby gibbons (photo encounter is less than 5 minutes). Only adult tigers, tiger cubs, and baby gibbons are at this location (all other endangered species including our ligers and elephant are only part of our Wild Encounters Tour). Note: If you’re wanting an immersive experience and lengthy experience with animals, please purchase one of our 3-hour Wild Encounters Day or Night Safari Tours (see Experience T.I.G.E.R.S. at top of page and click on either the Day or Night Safari Tour tab). While our Preservation Station photo encounter is a rare opportunity to hold a baby cub in brief photo shoot, it is not designed as a playing or petting experience. 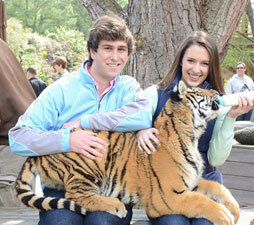 Photo encounters are $100 for 1 person, plus $25 for each additional person (2nd, 3rd, and 4th persons). The fifth person is $100 more than the fourth, plus $25 for each additional person (6th, 7th, and 8th persons). 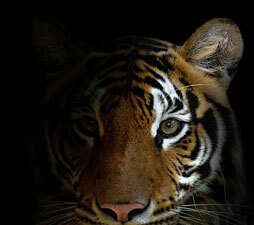 Your photo encounter purchase provides funding for our conservation efforts around the world. After your photo encounter, in addition to receiving your group’s selected commemorative photo, you will have the opportunity to purchase a digital photo upload that will include all photos taken during your Photo Encounter (additional fee applies). Seasonal hours: October 12th through November 24th – TIGERS Preservation Station will be available for online tickets purchases each Friday and Saturday. Photo Encounters must be purchased online no later than 2pm on the desired night of your encounter. PLEASE NOTE: If no Photo Encounter tickets have been purchased by 2pm on each day, TIGERS Preservation Station will be closed. * Animal Photo Encounters begin at the time of opening. Please arrive on time and immediately check-in with our staff. Guests with tickets/ reservations will be admitted before those without reservation. You must check-in with our team. There may be a short wait after check-in, so please be patient. * BOOK NOW! Although reservations are not required for this location, we strongly encourage all guests to reserve tickets for their Animal Photo Encounter. * Your tour and/or photo encounter purchases at our locations (either Myrtle Beach Safari or Preservation Station) will help support the Rare Species Fund (RSF), which provides infrastructure, training, education, and support for international conservation programs worldwide. To date, RSF has donated more than $1 million and countless hours of professional expertise, engagement, and hands-on training to grassroots conservation program worldwide. These programs ultimately help to conserve tigers, lions, elephants, gorillas, chimpanzees, and many more species in their natural habitats. * Please note, hours are subject to change based on weather and availability. Please visit our Google listing for current information regarding the weather and hours of operation. Phone Number: 843-361-4552 is an automated line for information only.